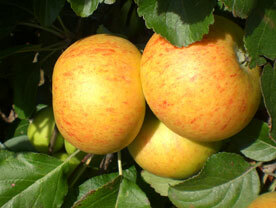 The Golden Bounty apple was raised in about 1940 by A.C. Nash of Scutes Farm, Hastings. The parents of this variety are Cox’s Orange Pippin crossed with probably Early Victoria. It is currently cultivated as part of Brighton Permaculture Trust’s National Collection in Stanmer Park, Brighton. You can see a Golden Bounty apple tree (planted 2010) in Home Farm Orchard, Stanmer Park ( map). Golden Bounty is yellow with fine orange and red broken stripes. It is crisp and sharply aromatic, like a brisk early Cox, and can be very good. Pick Golden Bounty apples during the middle of September and store until October. The Golden Bounty is a moderately vigorous tree that crops heavily.